Sadly, we must now bid Peter Tomasi and Patrick Gleason farewell with Green Lantern Coprs #47, their last issue on the title and an epilogue to Blackest Night. All of the Green Lanterns help lit up the central battery, and Kyle Rayner and Guy Gardner reminisce abuot all the crazy stuff that’s happened recently. On Mogo, with Morro’s agreement, a new memorial, a giant tree with the faces of all the deceased lanterns, is erected, and a green fire burns next to it so long as there is a Green Lantern. Arisia is angry that Sodom Yat is not on the tree, and Salaak lifts the moratorium on sending out and forging rings. Kyle and Soranik Natu look at the ruined mural of the history of the Corps. Kyle thinks that it will have to wait, but Soranik says that it should be prioritized for the morale of the Corps. Kilowog steps down as drill instructor, but he brings forward a replacement: Stel, who is more than happy to help. Isamot Kol gives his legs to replace Vath Sarn’s, since he apparently has a regenerative genome that might let his legs regrow. Vath is pissed, since now he looks like a Thanagarian, and the two of them start fighting. But Iolande tells them to grow up, and Vath agrees to try to get used to them. Guy, Kyle, and Arisia storm into the Guardians of the Universe’s meeting chamber, and Arisia punches one of them for leaving Sodom Yat to die on Daxam. Although they try to excuse it by saying that it was Scar’s fault, Guy and Kyle bring up the other problems, most notably, the law that prevents relationships in the core. Kyle says that the Guardians have to earn their trust again, and that they need to repeal the law to show that they also lead with their hearts. Salaak likewise dissents, saying that he will not be an errand boy to the Guardians, and that he will have questions about future policy. The Guardians unanimously agree to repeal the law, and Guy and Kyle celebrate in the ruins of Guy’s bar, agreeing that they will rebuild it. Well, the beginning of this issue was rather obnoxiously recap-y. As such, the dialogue was sadly very uncharacteristically clunky. I understand that Tomasi wanted to go over all the crazyness that’s happened since before Blackest Night, but I think it could have been done a tad more… gracefully. The memorial is a really touching idea, and I’m happy to see all the great interaction between the various members of the corps. Is it weird that I love seeing Vath and Isamot fight? 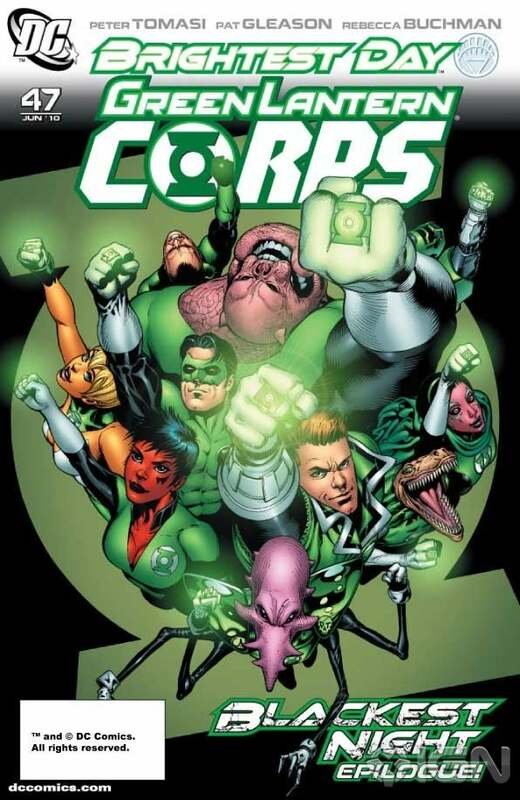 I also know that Kilowog and Arisia will be heading over to Green Lantern: Emerald Warriors, Guy’s new title, so it makes sense that the former is declining the drill instructor duty. And I love how righteously indignant Arisia is, how generally pissy Guy is, and how wise and calm Kyle is. That scene was a great showcase of Guy and Kyle’s characters and a great cap to the Daxam storyline with Arisia. Honestly, aside from the beginning section, this whole issue was just superb. Patrick Gleason’s art was also probably the best it’s ever been. I often complain about his faces, but this issue, they were great. Particularly Guy’s face on that one-page panel where he sees his ruined bar. He really stepped up his game for this swan song, and I hope he brings that quality to Brightest Day. Although this team is going on to work again together on Brightest Day, they’ll only be working together for small sections. Tomasi’s new Guy-centric book will feature Fernando Pasarin, not Gleason, on pencils, and that makes me sad, since they’re one of the top writer/artist teams in comic books. They’ve really put their stamp on the corps, and it will be very hard to replace them. I only hope that their replacements can live up to this legacy, the legacy of a pair that took some book that should have been canceled a long time ago and made it one of the top books in DC and kept it going for years. After all, I’d like to see it keep going for even longer, because I love these characters. Thanks for everything, Peter Tomasi and Patrick Gleason.